Saiphin Moore is Rosa. Well, there is no Rosa. Saiphin grew up in rural Thailand, set up her own noodle stall there at the age of 14, then after college moved to Hong Kong, where after making enough money working in a Thai restaurant, she opened her first restaurant, Tuk Tuk Thai. 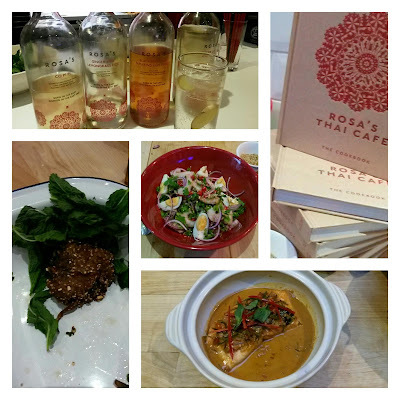 She moved with her husband in 2006 to London, where they found a disused cafe called Rosa's Cafe in Spitalfield's and turned it into the first of her chain of seven restaurants serving home cooked Thai food, as authentic as you can get in London. Saiphin's secret to cooking at Rosa's Thai Cafe is to keep it real. She cooks using authentic Thai ingredients, never substituting ginger for her lesser galangal, refined sugar for palm sugar, or regular limes for kaffir limes. All Thai cooking is based around four flavours - salty, spicy, sour and sweet. Each flavour can be tasted individually, and in unison. At the School of Wok, for their series of guest chef classes, Saiphin, along with Head Chef Jeremy Pang, showed us how to cook three of her dishes: Laab Tod - a spicy minced pork patty, Thai Aubergine Salad - the dressing you can use on any salad, and Red Salmon Curry. First we ground a bunch of ingredients in a pestle and mortar to make a red curry paste, and cooked it up with some coconut milk. While this was simmering we made Laab Tod, the spicy minced pork patty, which was then deep-fried while we made our aubergine salad dressing. This, my friends, was sublime. I'm posting the recipe below because I think everyone should have it. And best thing about it? It's really simple! Once you have all the ingredients (visit Chinatown or a good Asian supermarket), it's really easy to knock up. Once the salad was ready, we fried off our salmon, and poured over the curry sauce. Garnished with chillies, kaffir lime leaves and holy basil and galangal, it tasted delicious (although most people dipped into Saiphin's bowl to compare!). The patties were crispy and the secret to this was roasted ground rice. The aubergine salad - I'll say it again - was sublime. Eating amazing dishes, cooked by ourselves, with our fellow cookery enthusiasts, the School of Wok have once more demonstrated that preparation is 90% of cooking Asian food, and the results, with the right ingredients and guidance, show that cooking amazing authentic Asian food is accessible and absolutely delicious! Chargrill or roast the aubergine until the skin is brown/black. Set aside to cool. Once cooled, peel off the charred skin and cut into chunks. For the dressing, mix palm sugar, fish sauce, and lime juice. Stir well until the palm sugar is completely dissolved. Finish off with chopped red chillies and red onions, and adjust to taste with fish sauce. Pour the sauce over the aubergines just before serving. Garnish with coriander, spring onion, sesame seeds, prawns and egg.